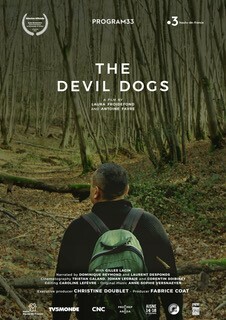 Filmed in 2016 in France and the United States, The Devil Dogs is a documentary that features the work of Giles Lagin, a World War I historian and tour guide, who has dedicated his life to connecting with American descendants of soldiers who fought in World War I. Since childhood, Lagin has roamed the land in and around Belleau Wood, France where, in June 1918, after three weeks of battle, the U.S. Marines stopped the German advance just a few miles from Paris. Those Marines earned the name of "Devil Dogs" and made victory possible for the Allies. In 2008, Lagin was made an honorary Marine in recognition of his work with American families, whose search for ancestral connection lead them to the battlefields of France. Carolyn Cole Kingston and Diana Cole, granddaughters of Major Edward B. Cole U.S.M.C., and Madeleine Johnson, grandniece of Captain Lothar R. Long, were together in France to be filmed for part of this engaging film. Major Cole, commander of the 6th Battalion of the U.S. Marines 4th Brigade, was mortally wounded at the Battle of Belleau Wood. Cole’s heroic actions won him many medals and commendations, including the “Croix de Guerre,” and he was the first individual from World War I to have a Navy war ship named after him. Captain Long, Intelligence Officer for Major Cole, worked closely with him from the founding of the machine gun battalion in 1917 until Cole’s wounding at Belleau Wood. Produced for the WWI Centennial, this film is a moving tribute to those who served in the “war to end all wars.” Join us for a special screening of The Devil Dogs (French with English subtitles) and Q&A with Carolyn Cole Kingston and Madeleine Johnson who will answer questions about their unique experience.